5 Bedroom Detached House For Sale in Milton Keynes for Offers Over £550,000. Located in the popular area of Brooklands and within easy reach of fantastic road links both North and South is this well presented five bedroom detached property. Overlooking the beautifully maintained parks and walking areas this house is wonderfully positioned and within a short walk of local schools both primary and secondary. When entering the property you are greeted with a light and spacious entrance hall with ceramic tile flooring and doors leading to all rooms, this flooring continues into the dining room which again is bright with lower windows giving you again fantastic views over the park. The lounge has duel aspect views with French doors leading to the garden and plenty of room for furniture. The kitchen is stocked with high and low level cupboards and is equipped with a range cooker and integrated dishwasher. The breakfast bar is perfect for informal breakfasts and there is space for an American fridge freezer plus French Doors leading to the garden. The ground floor is completed with a separate utility room with space for both washing machine and tumble dryer and a downstairs cloakroom. The first floor has three bedrooms and a family bathroom. The master bedroom has two double built in wardrobes and an en suite with large shower. The two other bedrooms both have built in wardrobes and this floor is completed with a family bathroom and airing cupboard. The second floor has two further bedrooms one of which is the second largest bedroom and the fith bedroom currently being used as a study. There is also a shower room on this floor servicing the two bedrooms and a handy storage cupboard. Outside the property has a front and rear garden. The rear garden has been landscaped with a large patio area and lawn. The property has a DOUBLE length SINGLE width garage and solar panels heating the hot water. Within a short drive of Central Milton Keynes main line station and shop and within very easy reach of Kingston District Centre with its array of supermarkets and restaurants this five bedroom home is perfect for any family. 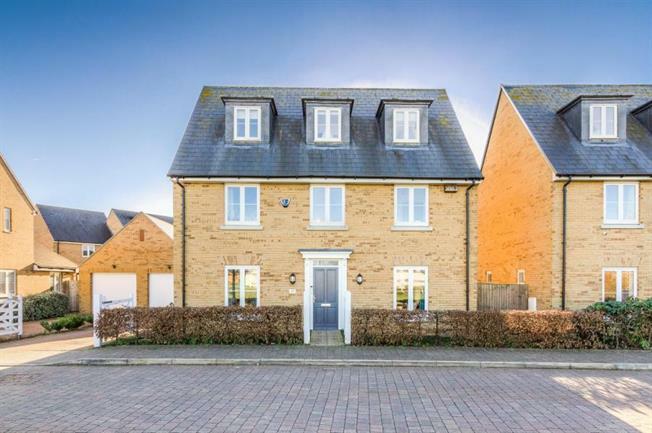 The property in brief comprises: Entrance Hall, Dining Room, Kitchen, Lounge, Utility, Cloakroom, Master Bedroom With En Suite, Four Further Bedrooms, Family Bathroom, Shower Room, Double Length Garage.